Part 1. What are slimes? Briefly, slimes are complex organisms somewhere between algae and sponges. They also have qualities shared with bacteria and with fungi, namely phagocytosis and asexual reproduction. Unlike these kingdoms however, slimes are eukaryotes with behaviour-driven motility and lack a cell wall. A slime has a top or lid, face, sides or sidewalls, rear wall, and a base. 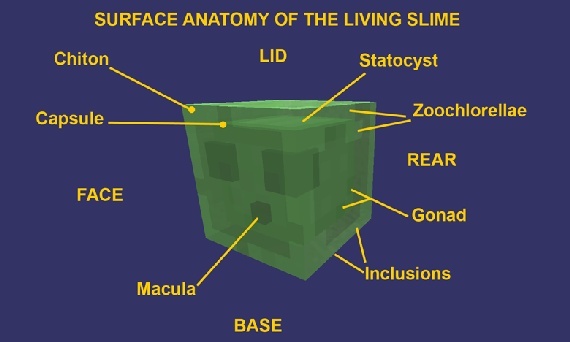 Living slimes are always oriented thus, and instantly re-orient themselves base down whenever they are tilted or fall at an angle. This is due to the statocyst or positional sensor organ in the slime’s lid. It functions like a primitive inner ear to orient the slime in space. Chiton – the thick outer slime coat that serves as a protective coating for the slime, and a primitive gut. The chiton is secreted by the capsule, the elastic true skin of the slime. Macula(e) – the sensory apparatus of the slime. They have been called “eyes” and “mouth” because of their shape. They are relatively insensitive to light, but detect exquisitely small movements and magnetic fields. Inclusions – These are mostly debris picked up and embedded in the thick chiton. Some inclusions are products of digestion from items the slime has engulfed. Gonad – A region of the slime that seems to be more metabolically active in the company of other slimes of the same size. Zoochlorellae – These are symbiotic algae and cyanobacteria that live inside the slime and provide it with oxygen and starches. In turn the slime protects the algae from heat and desiccation and provides trace minerals and reduced nitrogen compounds. These organisms are what give the slime its green color. The capsule of the slime is tough and elastic, like a tendon or a thick sheet of rubber. Inside the capsule, the slime consists of three specialized areas, arranged roughly from front to rear. The pyxosome is the area right behind the maculae and is a heavily pigmented mass of dense but friable gelatinous material. Microscopically, it is composed of myriads of nests and coils of sarcoplasm surrounding larger canals filled with serum. The serum component has a high content of soluble heavy metals including redstone, iron, gold, and adminium. 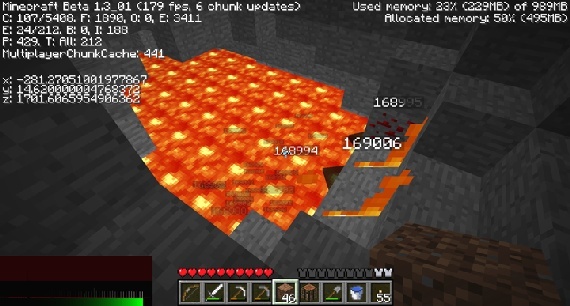 It is possible that as much as 70% of a world’s elemental adminium is bound up in slimes, the rest occurring as the dark bars in common bedrock. The pyxosome may be responsible for slime’s sensory functions. The opisthosome occupies the rear of the slime and contains the gonad. In truth the gonad is acellular but rather is made up of a few large, pale inclusions with high organic nutrient content. Bergensten et al. propose that the structure actually is where undigestible materials are stored so as not to damage the slime’s internal chemistry. The elasmosome makes up the majority of the slime and is a colorless to light green, translucent material the consistency of Guk (TM). This is composed almost entirely of matted lattices of microtubules. This is the locomotive engine of the slime and surrounds the other two internal portions, anchoring them to the capsule and to one another. It also provides extensions through the capsule to anchor the chiton in place and stimulate additional chiton secretion in regions of high shear stress. The commercial slimeball is actually made up of the elasmosomes of freshly killed slimes. 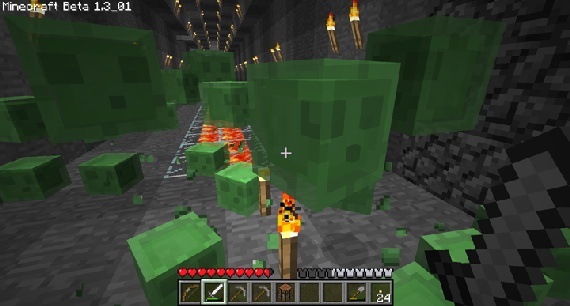 This herd of slimes occupied the lava pool shown here for several minecraft days. 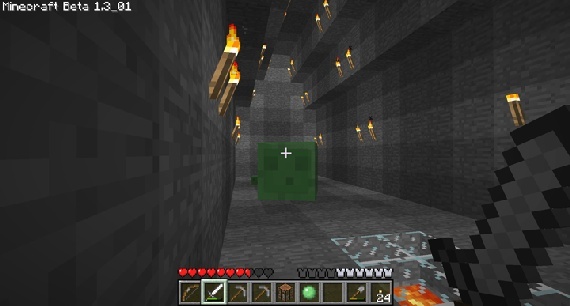 Slimes are found deep underground, in areas where constant high temperature and humidity prevail. Since slimes are facultatively photosynthetic, they thrive in and around caverns lit up by magma flows, volcanic vents, and even the high energy lamps used in deep shaft mining. Due to their thick chiton, they are notoriously resistant to fire and burns. Since slimes require oxygen to live, they rely on their symbiotic zoochlorellae to provide a small amount. Transplanting a slime into a totally dark oxygen-poor volcanic flue or sulfur vent can suffocate it. However, if a light source is provided, the slime may survive indefinitely (although it will not grow or reproduce). The small slime in the center foreground is drowning. 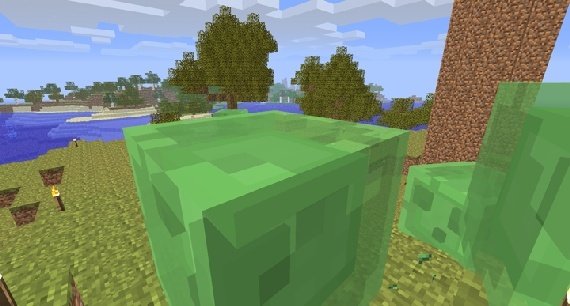 Slimes are limited to areas where water and ambient moisture are high. Although they can desiccate if stranded or trapped in dry air, they can retain a lot of water and this allows them to migrate long distances to new caverns. Contrary to popular belief, slimes can’t swim and they do drown when submerged in water. Commercial elastics harvesting relies on large deep pools or moving conveyors to drown young slimes. 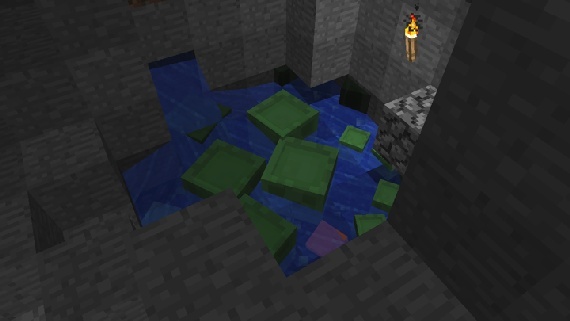 These slimes are migrating from a dry underground tunnel system to a freshly opened mineshaft, which is still damp. Slimes of all sizes and life stages in a stampede, a rare and dangerous phenomenon associated with strip mining or flood mining. Slimes reproduce either sexually (details unknown) or asexually (fission) to produce daughter slimes. The daughter slime or calf is less than 1 m cubed and has little or no enzymatic activity. It contains relatively more nutrients in the form of inclusions. These sustain the small slime until its own enzymes mature. As the slime grows, it becomes capable of engulfing items for food. These digestive properties of the chiton may cause damage on contact with the slime. When it is roughly 8x the weight of a new calf slime, it can reproduce by fission. This often happens when the slime is damaged – the slime divides along a defect in the capsule, healing the defect and producing up to four daughter slimes. A mature slime is quite large, slow-moving, and heavy. It has a relatively low moisture content compared to the youngest slimes. To compensate, it produces more concentrated digestive enzymes and acids which are toxic to nearby lifeforms. As a slime ages, its elasmosome loses elasticity and tends to calcify. 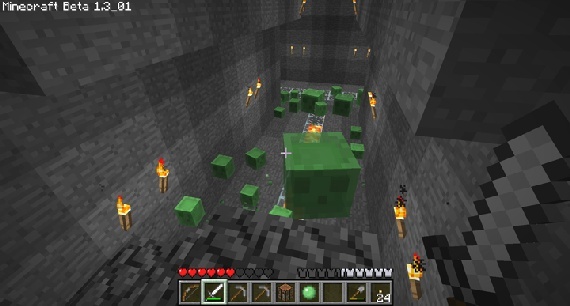 This can result in large, old slimes getting trapped in corridors or narrow spots and suffocating. Slimes have a remarkable elasticity. This image shows the range of slime compressibility in normal locomotion. 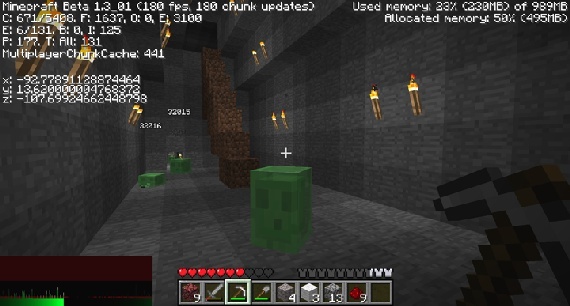 Slimes may fit through doors and in stairwells that appear to be much too small. A matriarch slime protecting a daughter. Slimes are found in herds throughout the world, always in geothermally favourable chunks. Although slimes do not exhibit nesting behavior or any other advanced social system, they do have a primitive herd behavior wherein the larger slimes may protect the smaller ones. 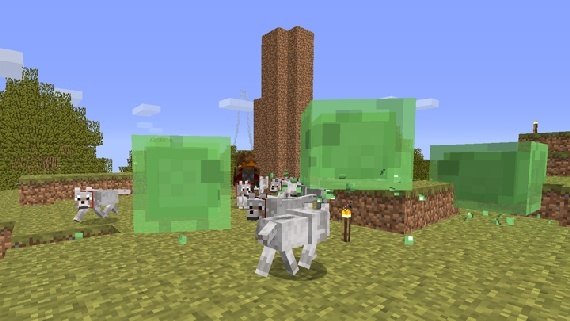 Small slimes in a herd may collectively push invaders away from resources or off precipices. Slime intelligence is otherwise rather low. Slimes – unicellular or multicellular? 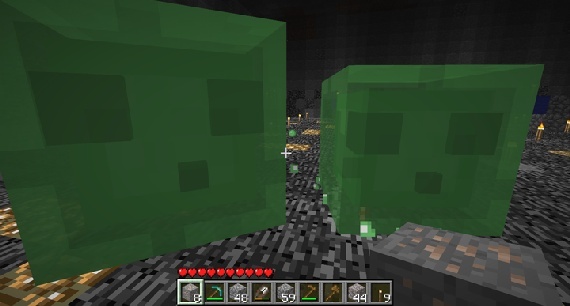 Are these slimes identical, or fraternal, twins? Perhaps the strongest evidence for slimes being multicellular is the macula, which doesn’t appear to have a direct physical communication to any other part of the slime, but activates locomotion and storage of trace metals in other parts of the slime. Slimes in a slime game park enjoying a brief moment in full sun. 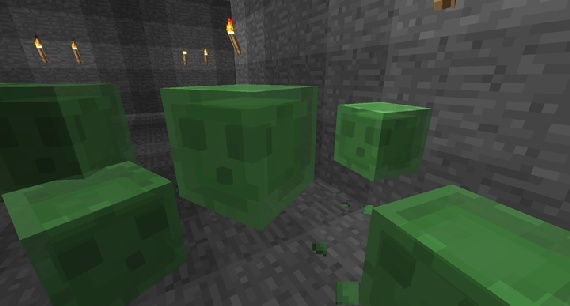 Slimes have been transformed by popular culture over the past 5 expansions. The slime is a strong symbolic figure in the human psyche as a rare, elusive, dangerous, alien, even droll and endearing creature. Modern technology relies heavily on slimeballs as a commercial product, from slimes grown in artificial labs in great numbers under ideal conditions. One disturbing development is the breeding of slimes for populating slime parks and safaris. Slimes are bred and brought to the surface and exposed to sunlight. This causes them to take on an intense green color and become agitated. They are then released into well-tended parkland and hunted from the air or the roadside. Some parks let hunters use packs of hunting dogs. This last is exceedingly cruel for both the slimes and the dogs. Hunting slimes with dogs is illegal in several countries. Slime petting zoos are common children’s roadside attractions in mining towns. Because the smallest slimes are innocuous, they can be held and petted. Sadly, they are force spawned by slimepunching, wherein adult slimes are placed in a machine and pummeled with pistons or even a handler’s gloved hands. The slimes accumulate damage and eventually split off daughter slimes. Once tourist season is over, the baby slimes are frequently drowned or dropped off a ledge. The resulting slimeballs are then sold to elastics firms. The Slime Protection Agency was founded in 2010 to protect slimes from exploitation and promote humane industrial and commercial slimeball harvesting. Since then Dupont has developed the first artificial elastic material for making sticky pistons. Slimes remain a curiosity and are still subject to abuses as pets and trophy game mobs.